Fracplanet is an interactive tool for creating random fractal planets and terrain areas with oceans, rivers, lakes and icecaps. The results can be exported as models to POV-Ray and to Blender, or as texture maps for more general usage. The code is licensed under the GPL. It uses Qt and OpenGL. See the gallery for examples of the fracplanet application in action. Source downloads, various .deb files and other project information are obtainable from the sourceforge project pages. Assuming you have Qt and qmake (and a correctly set up gcc of course), it's trivial to build. The application will perform much better if you have OpenGL hardware acceleration enabled. Martin Smith has done a port to Java (NB it's a Java application, not a browser applet). Mac users may be able to find a port at ATG. Note that you will also need to install the supporting Qt toolkit separately; it's also available from the ATG site. (NB Qt is NOT the same as Apple's Quicktime). I'm not currently aware of any port to win32. However all is not lost if you are unfortunate enough to be stuck with such a system. The easiest solution is probably to simply run the Java port. The harder solution is to temporarily boot your system into Linux using the Ubuntu "Live CD". The following procedure is known to work on a machine (an old 400MHz Celeron) booted from an Ubuntu 6.06 CD (disk image ubuntu-6.06-desktop-i386.iso). Note that it doesn't install anything on your hard drive. Boot the system so it boots off the CD. Select "Start or install Ubuntu" when the menu appears (this will be selected automatically if you wait a while). A desktop should eventually appear, hopefully at a sensible resolution for your graphics hardware. (I find Ubuntu a little optimistic; if you need to reduce resolution select System - Preferences - Screen Resolution to make changes). Check the net access by opening firefox (the blue globe icon in the bar at the top of the screen) and navigating to http://sourceforge.net/projects/fracplanet/index.htm. From the menu bar at the top of the screen (not firefox! ), select System - Administration - Synaptic Package Manager. Close the introductory dialog and select Settings - Repositories. In the Software Preferences which appears, tick the "Ubuntu 6.06 LTS (Binary) Community maintained (Universe)" entry and close the dialog. A dialog will appear telling you to hit "Reload", so close that dialog and hit the "Reload" in the top left of the package manager. Wait a short while for the "Downloading package information" to complete, then close the package manager. Back in firefox, select the fracplanet pages "Files" link. Scroll down the resulting file releases page a little and click on fracplanet_0.3.2-1dapper1_i386.deb. Pick an appropriate mirror on the next page, "Continue" on the security warning dialog, and opt to open it with "gdebi-gtk" (then hit OK). Wait a short while for a package installer application to appear. Simply hit "Install Package", and then Grant on the dialog requesting administrative rights. Wait quite a while; the dialog should eventually say fracplanet_0.3.2-1dapper1_i386.deb was installed, at which point you can close the dialog then close the package installer (and also close firefox and firefox's downloads dialog). From the bar at the top of the screen, select Applications - Accessories - Terminal. In the terminal which appears, type fracplanet and hit return. The fracplanet application should appear (after a few X error messages are spewed to the terminal; these can be ignored). Enjoy fracplanet. 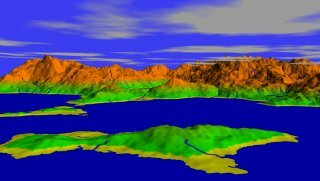 The mother of all terrain generators: Terragen. Martin Smith's Java port of fracplanet and other planet building tools. A real time procedural universe (NB "wayback machine" archive link).